Members of a growing movement are taking their money off of Wall Street and investing it in local food systems through small peer-to-peer loans. Slow Money lenders watch their investments used to grow businesses and farms right in their own communities. Host Frank Stasio talks with Carol Peppe Hewitt, the founder of Slow Money NC. 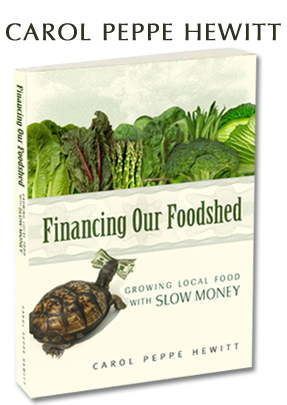 She reads from her new book “Financing Our Foodshed” (New Society Publishers/2013) at Flyleaf Books in Chapel Hill tonight at 7. Slow money is a movement that grew out of the 2008 financial collapse. The first principle of that movement is to “bring money back down to earth.” It calls for investing in local farms and food products. On today's program we are going to consider the Slow Money movement in North Carolina and ask this question: what if we applied the principles of Slow Money to things beyond food and farms? What happens when we create a system that values businesses that create healthy local economies and environments?